Devon More’s Berlin Waltz ran July 31 – August 8 as part of the 2015 Calgary Fringe Festival. Photo Credit: Petrocker Photography. For singer-songwriter Devon More, live performance offers an invaluable opportunity to plant new ideas. And with endless information at our fingertips, live performance is more important than ever in this age of Web 2.0, says More. Last month, More premiered her one-woman musical comedy Berlin Waltz at the Calgary Fringe Festival. Through original music and puppetry, More staged Berlin’s history during the Cold War, from the end of World War II to the fall of the Berlin Wall. More felt inspired to develop Berlin Waltz after living in Germany’s capital city for four years. With her best friend joining her, More set off for Germany. Upon arriving in Berlin, More and her friend attended an orientation session on how to navigate through German bureaucracy e.g. work permits, tax numbers. Despite her limited German, More found work at a pub. Working and living in Berlin, More started to recognize something amazing about the city. Even after “witnessing all the extremes, all the worst possible outcomes” just decades before, Berlin still held the arts in high esteem. More returned to Canada in 2012. 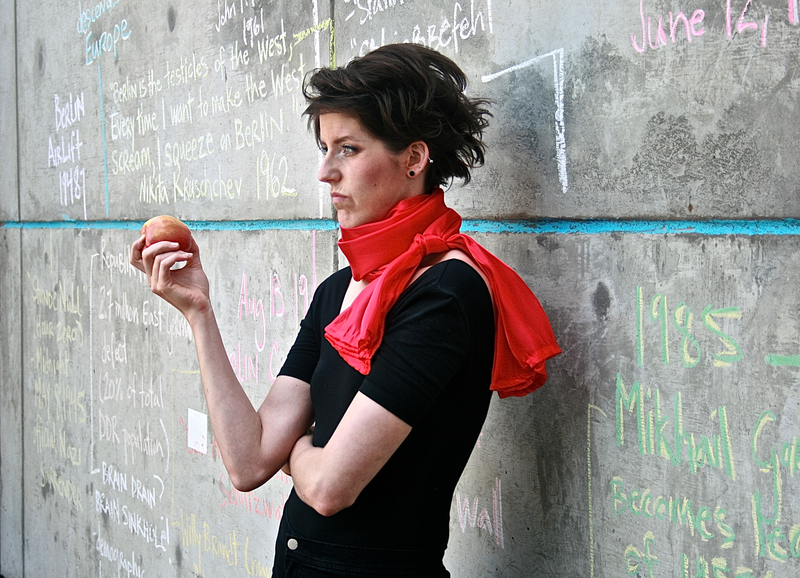 Development on Berlin Waltz would begin after More’s 2014 fringe tour. With this in mind, More searched for a subject that she felt ready to invest all her time and energy into. Although much of the show’s content comes from what she learned while in Berlin, More says research was necessary in order to accurately and properly contextualize the events that shaped Berlin and its people. More’s Berlin Waltz stands as a love letter to a city, an intimate encounter between biography and history, and also, a call for action. In her show, the artist encourages her audience to question actions taken by the Canadian government, specifically the introduction of invasive bills like the controversial Bill C-51. Looking ahead, More says she will perform Berlin Waltz again. She intends on using all the feedback she received to fine tune and polish the show. Ultimately, More says, she hopes to continue inspiring people to consider the parallels between what happened in East Germany and what is happening here at home. Devon More’s Berlin Waltz ran July 31 – August 8 as part of the Calgary Fringe Festival.